What is your REAL value to others? 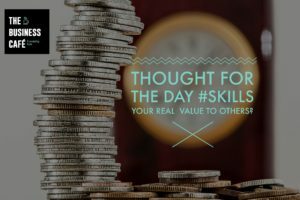 This morning I woke up with the thought around value. Our time, money and attention. I thought this would be a good topic to discuss as it is complex yet so critical to all our success in business. Value, what are we really selling and receiving. We are all limited in our time, money, attention spans and energy. Yet, these are the resources in life we need to be given by others to survive. To gain your attention now, is a real privilege, when someone spends money with me, or I do something for free for them, means we are all giving our time, it took time for them to earn the money they spend, it certainly takes time to give something for free. Finally, energy, I need loads of this and I have to ensure I spend time wit h others that give me energy. Energy and money needs to be in a circle, if it isn’t then we all run out of it. I give, you receive, and you give, I receive. I also think money needs to buy energy, whatever the thing is that we buy. Money certainly needs to buy value that is longer than the immediate moment. So, time, money and energy, are they in abundance, sadly not, they do reduce over the day, replacing these commodities in our life is critical. Respecting another persons time, money and energy is a must. So, the beginning of each month, like you, I sit with a bank balance, a month of time ahead of me in my diary and a great deal of energy, in both my domestic and my business account. Where do I spend my resources throughout the month, and do those things replenish me, or deplete me and my business. This is the ROI, the return I need to seek for all the expenditure. One priority for myself personally is a massage, I like at least two. Do I want massage, or do I want peace, touch, love, removal of stress. But what is the masseuse giving me? Is it those emotions they want to leave me with long after the moment, or are they simply filling the one hour slot I paid for. I need an accountant I know the standing order that goes out each month. Is my accountant purely crunching the same old numbers, or are they giving me peace of mind around my tax, my VAT and the management of my cashflow in order that I can make the best decisions for my money. Do I every sense that my needs are on their mind? Value for money for me is not at that moment that I spend it, it is the impact of the decision I took. Most of us give good consideration around how we use our resources. But does the person consuming our resources really get the value they want? Do we ask, “what is the feeling, output, result that you want to have after you have consumed, spent and had my service”. Do we think about that enough? So today, I want to turn things on their head. When we have thinking time, think about the impact of our service, our business, and ask ourselves, what is the real value I give when I take someones money, time, attention or energy? I certaining think about this everytime I write my thought for the day, I want to know that the 5 minutes you gave me now, has given you value, your attention is the kindest act of my day that I receive, so thank you.Today and everyday, I never take it for granted.